Back on market as of 8/25/18. 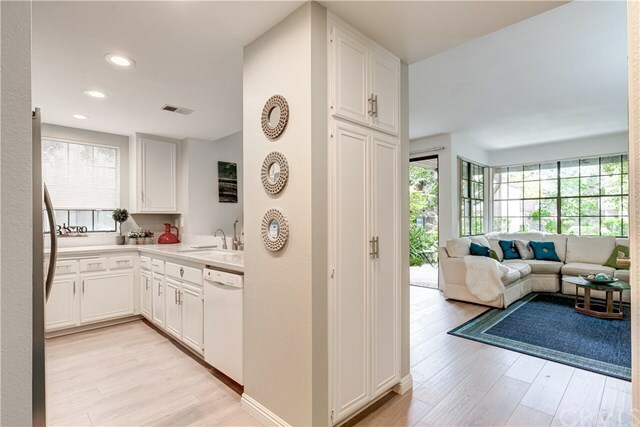 This stunningly remodeled condo is a must see in the gated Woodlake Community! Features of this contemporary end unit include light wood laminate flooring with 4" baseboards throughout, high ceilings, central A/c and heat, and convenient private laundry. Kitchen has been expertly remodeled with new Crystal Quartz counters, white cabinetry, new sink and stainless steel faucet, new microwave, new blinds, and recessed lighting! The beautiful quartz breakfast bar opens up the kitchen into your living space with mesmerizing diamond glass fireplace. Off the dining room, enter the lush patio on the lake, views of beautiful waterfall, boulder quarry, and nature views with enclosed laundry closet. The remodeled bathroom has new quartz counters, new full mirror and lighting. The bedroom is well-sized with two closets (one walk in and a full wall), new floor-length levolor vertical blinds, and a second private patio! Woodlake is an exquisitely landscaped zen and nature inspired gated community with sounds of running water, an abundance of ponds, flowers, plants, trees, and beautiful views throughout yet still located in the trendy cosmopolitan area of South Coast Metro. Down the street from some of OC's finest shops, restaurants, entertainment, South Coast Plaza, OC's Segerstroms Performing Arts Center, SoCo, and Metro Pointe. Directions: Enter gate off MacArthur Blvd. Unit toward back south end of complex.